UCL, home to the George Orwell Archive, is hosting the first staged reading of Orwell's Burmese Days on 4 and 5 November. The reading marks the 75th anniversary of the publication of Orwell's first novel - a satire on the last days of British imperialism after the First World War, informed by Orwell's own experiences in Burma. It features larger than life characterisation and extravagant language. Orwell himself said of the book in Why I Write: "I wanted to write enormous naturalistic novels with unhappy endings, full of detailed descriptions and arresting similes, and also full of purple passages in which my words were used partly for the sake of their sound. And in fact my first complete novel, Burmese Days.... is rather that kind of book." The novel has been adapted for the stage by Ryan Kiggell (UCL Geography 1999) and will be performed by the International Theatre Collective, Aya. A question and answer session will follow the reading. 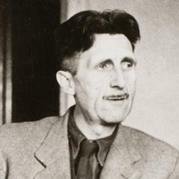 UCL is in the process of digitising the George Orwell Archive: one of the world's most comprehensive bodies of material relating to the writer's life and work, held by UCL Library Services' Special Collections. View a selection of Orwell's personal diaries, writing notes, photographs and original dustjacket designs by following the gallery link at the top of this article. Ryan Kiggell describes why he adapted the novel for the stage (4 mins 19). Please note that the reading is taking place at the Jeremy Bentham Room. Images: (top) George Orwell in 1945; (right) Orwell's National Union of Journalists' membership. See the gallery of images for more.